We are 341 years old, the oldest hat shop in the world. 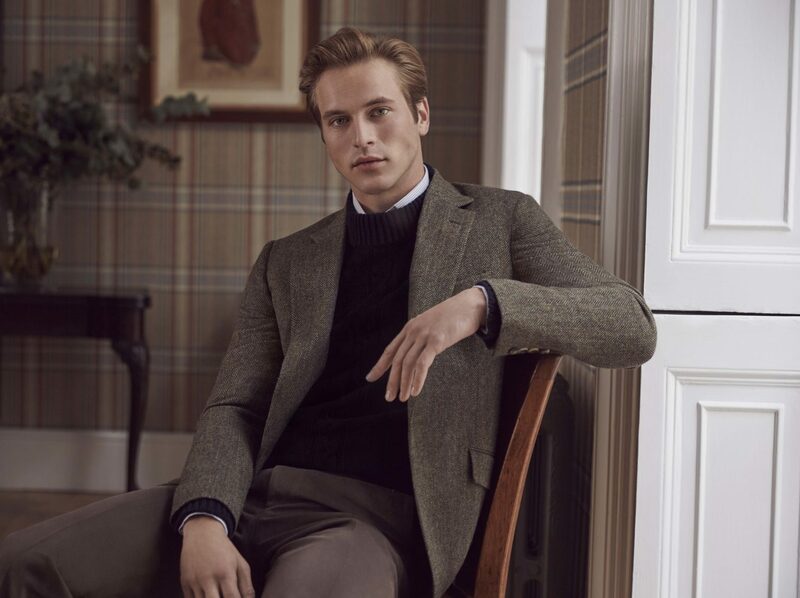 We are the oldest retail shop in London now and the 3rd oldest London based family owned business; still owned by the same family. One of two, there are two families, my family and the original descendants of Mr Lock. 1676. We originally started on the other side of St James’ and moved to our current site in 1759 because it is the sunny side of St James’s. You always do more business on the sunny side of the street! We invented the bowler hat in 1849. Ah! 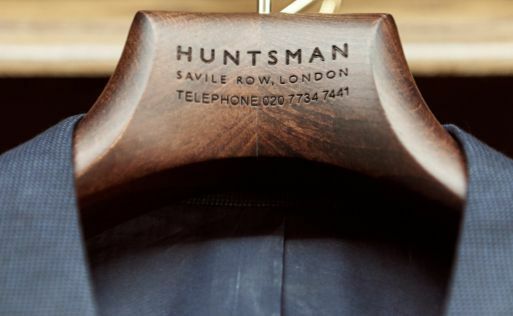 The year Huntsman was founded! Yes indeed. 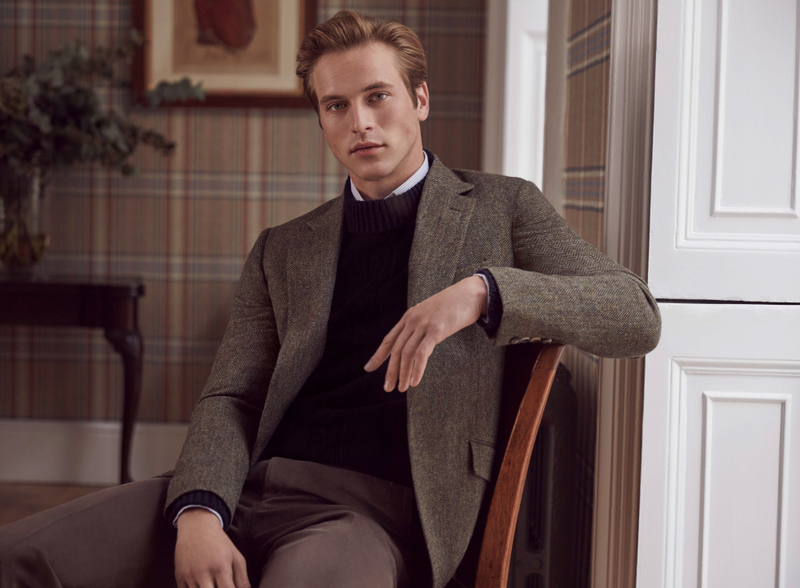 We were commissioned by William Coke of Norfolk to design a hat for his gamekeepers. They wore top hats up until then! 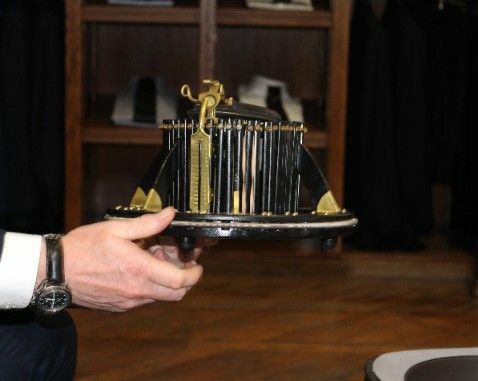 Every time they were riding they would catch on low flying branches and the top hat would come off, so they wanted a hat with a domed top which would glance off branches and protect his gamekeepers – so we designed the bowler hat for them! The bowler hat was originally a worker man’s hat. In Victorian times, it was used by railway workers; on building sites today, we see everyone wearing hard hats. Quite odd isnt it, when we know associate bowler hats with being smartly dressed. Top hats really came into being in the late 1700s. Before that, the hat of choice was the Tricorn hat. The Tricorn phased during that time period of history as it was led by the aristocracy. The aristocracy generally wanted to look different to everybody else, so the top hat came into being. In the late 1700s, when the aristocracy started wearing black top hats, they wanted to stand out from the crowd. James Lock III invented the grey top hat and we christened it ‘The Ascot’. This was only worn in the royal enclosure at Ascot, so the aristocracy could separate themselves by being the only ones wearing grey top hats! In 1790, originally, they were made from beaver fur which is similar to a top hat made of rabbit fur. Silk came into being in the 1790s and was known as hatters plush. What is the Band around the hat made of and why is it there? The band is known as a ‘morning band’. 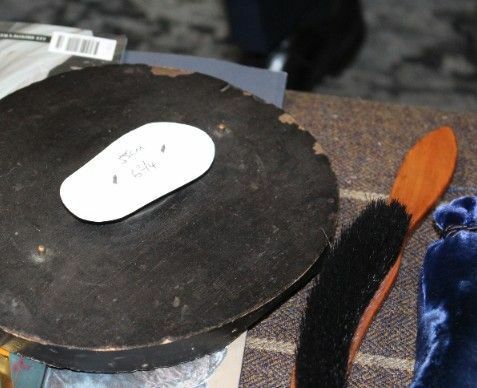 Traditionally it was a felt band that came into being after Prince Albert died. When the country was in mourning, everyone wore mourning bands on their top hats. Quite often you can use it to date a top hat. Before his death, they tended to use a silk ribbon, so anything after the death of Prince Albert tends to have a felt ribbon called a mourning band. We find that grey top hats were very popular right up until around the early to mid-80s, as it seemed everyone wore grey. Grey then suddenly came out of fashion and black had come back in. Everyone knew the top hat was grey – now we sell probably 6 times as many black top hats than grey. Do you think it is just a reaction to the popularity of black hats? There could be a turnaround but I think the elegance of the black hat makes it the look of choice usually – black always looks very smart! 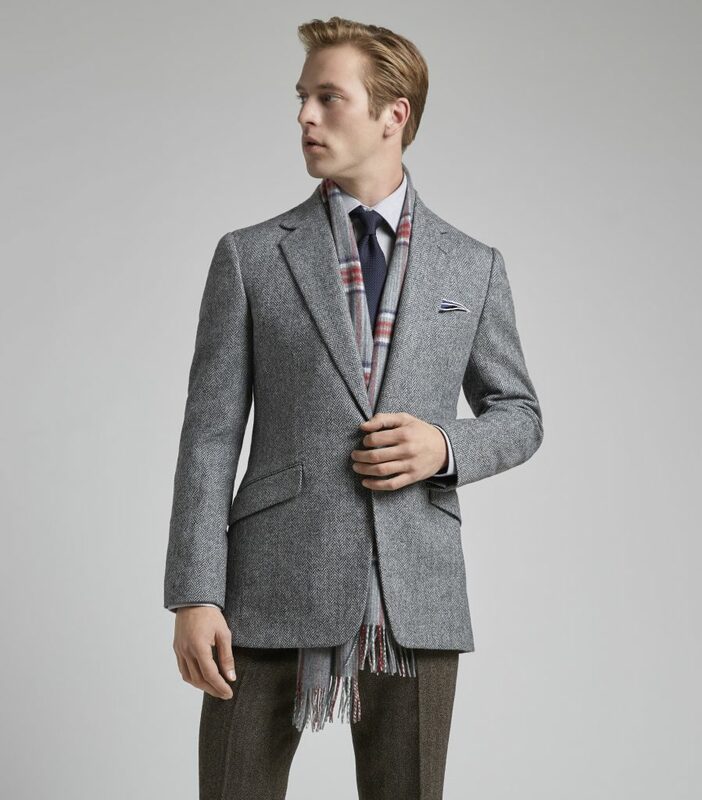 Grey may come back again, I think you may see the odd cutting edge guys starting to wear grey again and suddenly the trends might turn, however, at the moment we are seeing no sign of it. Is the silk always in black? The silk is always in black. 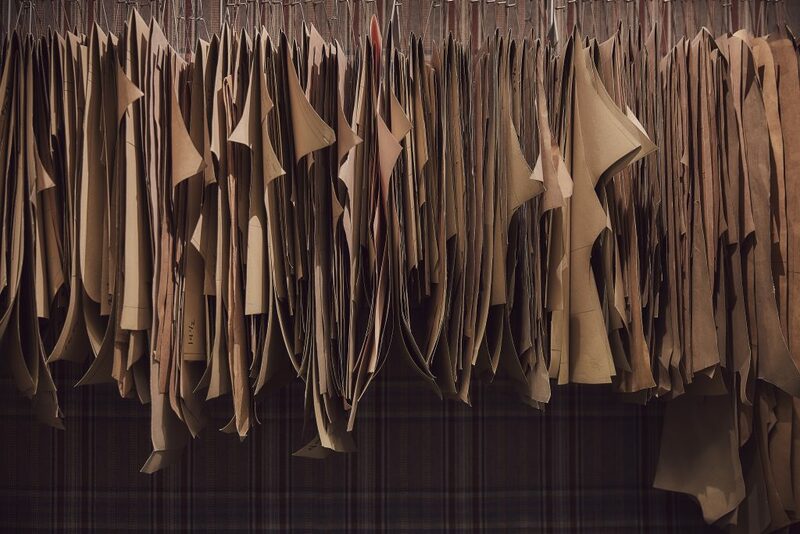 All of these [top hats] are vintage – the silk is no longer made. In the mid-60s the silk plush was made in France in only one factory. The story goes that it was owned by two brothers who fell out with each other and one burnt the factory down to spite the other one! When the factory burnt down, the looms burnt with it, all the information, all the technology went with that one factory. So, from the mid-60s onwards silk is no longer available. Today all the silk top hats we own are vintage silks which we then buy in and refurbish. The problem that you have with all of the old silk top hats is that everyone’s head size was generally smaller back in the day – the average head goes up one size every ten years. 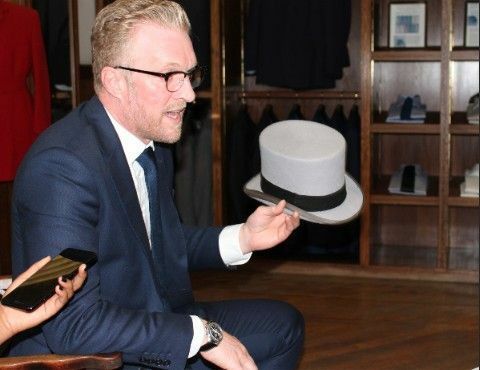 So, the problem we have is finding silk top hats to fit people with bigger size heads. We are very lucky; we have just picked up a size 8 silk top hat which is a 65 cm which is as rare as anything. It’s the first one we have seen in probably 20 years! The big sizes fetch a premium. 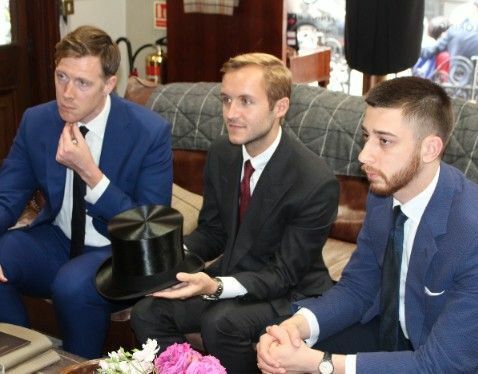 So if someone wants a silk top hat and has got a big head, they are going to have to be prepared to pay for it – they are very rare and very valuable. Does that mean they are getting more and more expensive as they become rarer? Yes, it’s supply and demand everyone wants the silks! The other thing we look for is the body of the hat itself being in good condition. 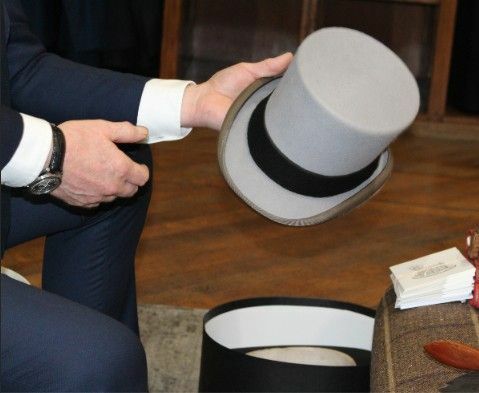 The problem you have with all top hats is, that when someone has a few drinks and take their hat off and they always stick it down on the table, which creates a wear on the edge! As long as there is no damage to the body and the edge is in good condition, the rest of the hat can be refurbished. 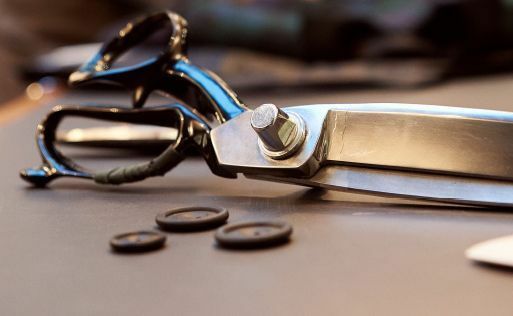 With this, you can have a new band, new binding, more lining and leather – that can all be done. Surely it can be reverse engineered in 2017? Well, you’d like to think. It’s my personal goal and I’ve been going up a lot of blind alleys with it. 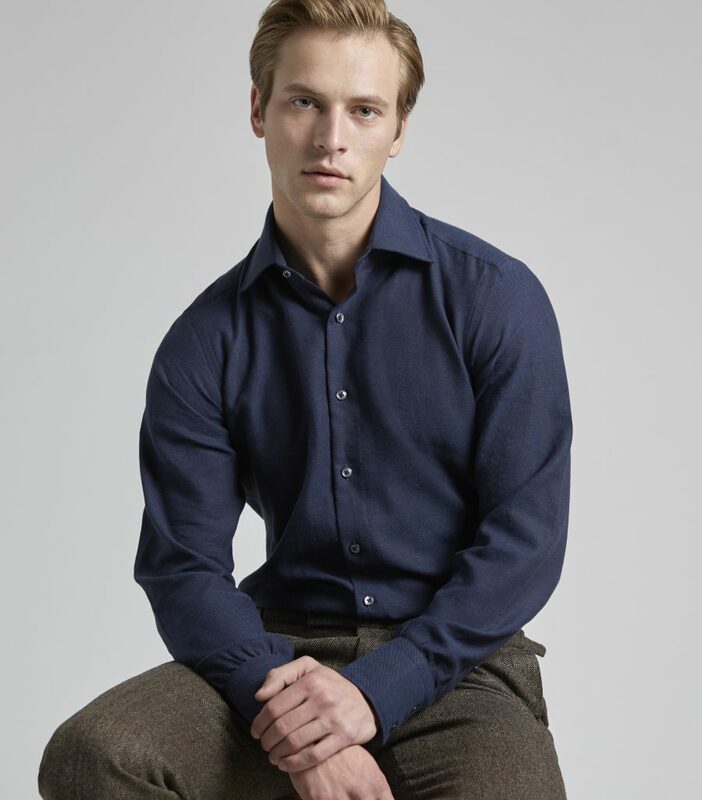 I’ve even spoken to Gainsborough, a silk makers in Suffolk who produce for the Royal family. A gentleman there told me he’d spoken to people from the company who had been working with silk for the last forty years, and if anyone is going to know about it, they will, but no one can find the same information on how to do it that burnt down with the factory in France. That is the complication, yes. We get people asking us or we hear rumours that ‘someone can make this in Czechoslovakia’, so we get a sample sent to us that arrives as silk scarf material – that fine silk that just isn’t hatter’s plush. I would love to find a way to be able to produce this because the demand for new silk top hat would be phenomenal. How should one polish and keep their top hat in good condition? 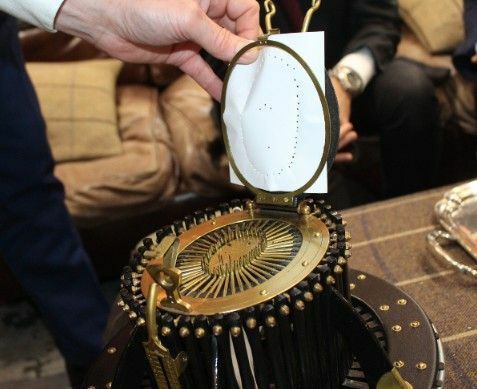 If you want to polish a top hat we recommend stiff brush just to get the pile going down. So, you work with the pile and then use a little water a spray to lightly dust it. Next, use a velvet pad and repeat. That will eventually, once you have put the water on it, shine quite nicely. You can get quite a good shine from a rabbit fur felt but you still won’t quite get the same shine as a silk. 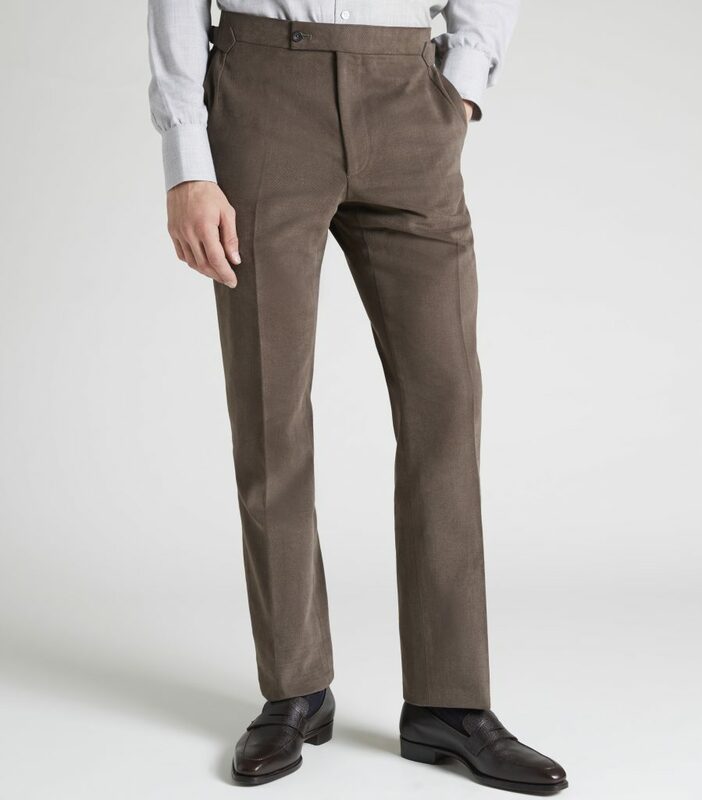 What do you find people wear them for mostly? Really it is Ascot, Golden parties at the palace and weddings generally! But haven’t they stopped wearing top hats at weddings though? A little bit yes, mark my words they are going to make a comeback…! Oh! Well, you heard it here first! 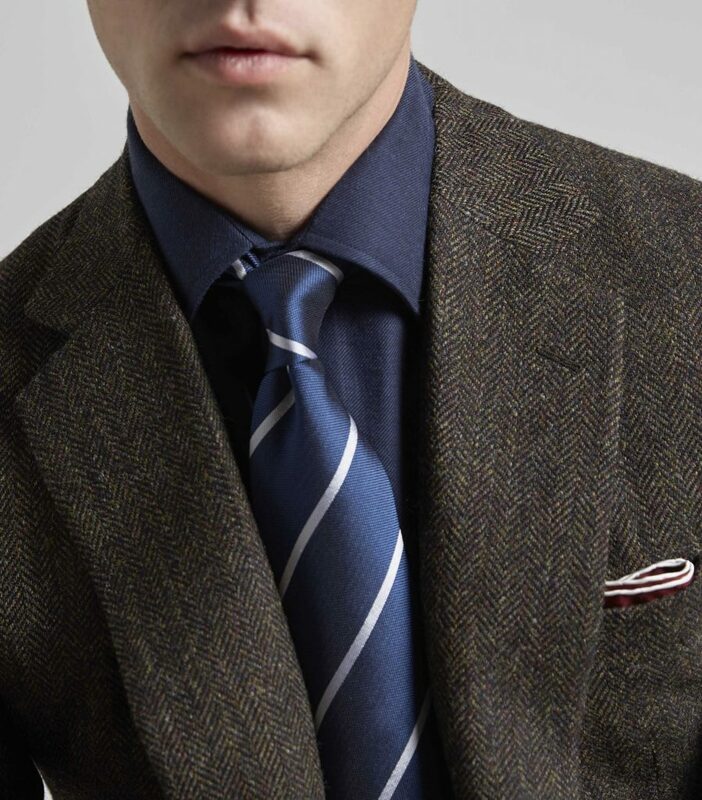 We are finding not just Ascot but also things like Derby, even Goodwood, people are starting to wear them. So it is becoming a little bit more formal wear to wear a top hat and not just horse racing. 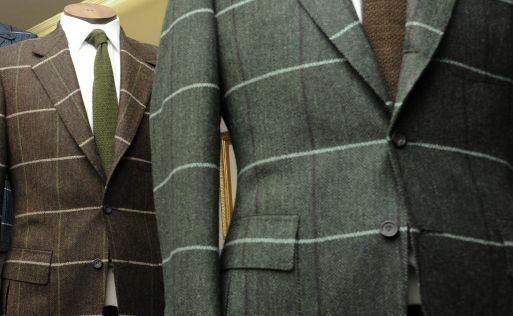 I had a Gentleman in today; he wanted to buy a silk top hat and he said “well I am only going to wear it twice a year so, you know can I really justify the £3,500” but in response, it is the same with morning suits! These are a lifetime investment. 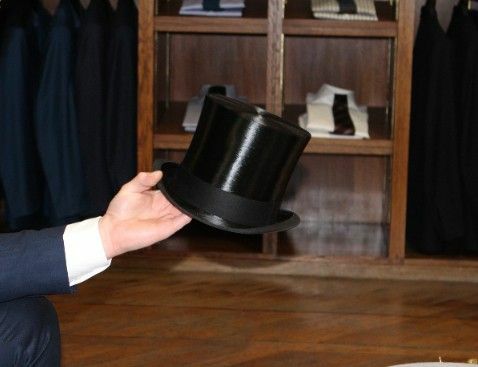 You only buy a top hat once (unless you loose it, sit on it or do something silly) but they will last you a lifetime if looked after and you will pass them on to your children. 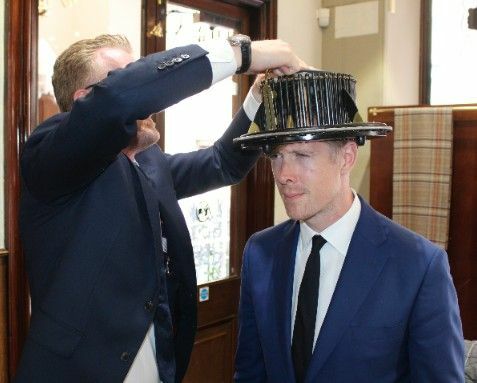 So, how exactly does one get measured for a top hat? So, now onto our famed contraption – the Conformeter. It dates back to 1850 and was designed and made in Paris. Quite a rare thing in itself, there is not many left in existence, but we [Lock & Co] own about 8 of them. Every time one comes up for auction we tend to buy them because they are quite fragile in their own way and some work better than others, this is a particularly nice one. Actually, I have to say, you’ve got a very long oval but very very even shaped head! Okay, so once you get the head shape you cut around the outside of where the pins are. Then you put in on the block.Then we use this adjustable wooden block and loosen these off, you drop it over the top, push all of the pins in so that it follows the contour! And then that’s the full size? And then that’s the full size of the head so these are reusable. We’ve actually got a solid wooden block for the Queen, we just had that made especially for royalty but usually, these are reusable. So from start to finish, the process takes about 20 minutes. If anyone wants to be fitted for a top hat it doesn’t take that long. Someone told me you might be a descendant of the original Mad Hatter, is this true? Yes, my great great great great grandfather was a gentleman called James Benning, he was the original mad hatter that Lewis Carroll based his character on. Well, in actual fact milliners used to use Mercuric Oxide to stiffen the brims of the hats. The fumes from the mercury began to affect your central nervous system and eventually send you mad! Who have been your most famous clients through history? Royalty! My Grandfather fitted the crown for the Queen’s coronation and my father hatted Princess Diana before she died. We also have people like Edward VIII before he had abdicated and we’ve got Royal Warrants for Prince Philip and the Prince of Wales. Oh wow, any other famous people? Winson Churchill was a big customer of ours. Charlie Chaplin, Sean Connery for the Bond Films! Sean Connery for the Bond films! Yes, we hatted Sean Connery but also Oddjob for his bowler hat in Goldfinger. That was one ours as well. We also supplied the bowler hat for Mr Shifter, the chimpanzee in the PG Tips adverts. We found his name in our ledgers when we were doing some research. There we found Mr A Chimp in the late ’60s for one bowler hat size 5 ¾ – which I think is fantastic! 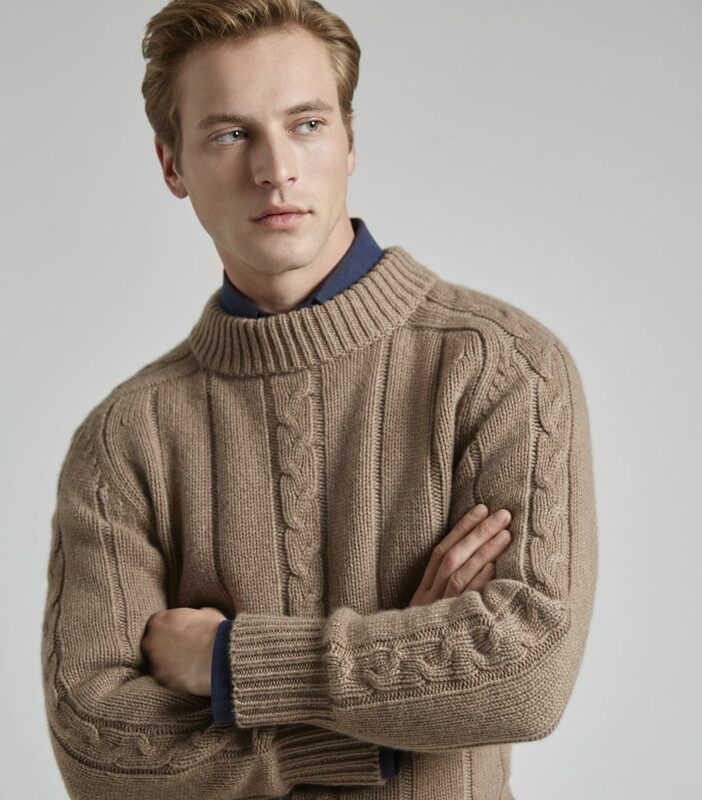 Tell us an in store faux pas over the years? Well, wigs coming off in the conformeter! Does that happen quite a bit? 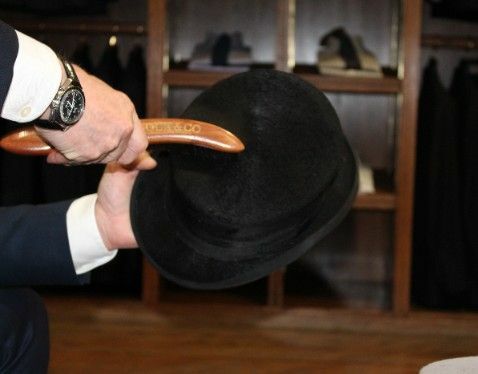 Finally, tell us some top hat etiquette! Always wear them straight or off to one side, never on the back of the head. That is the rule of thumb. Ladies can wear hats indoors, gentleman can’t. And of course, you should always take your hat off when you first meet a lady. oh, and don’t sit on it!